LHV favourable instalment payments allow you to make payment for goods/services in parts. Fill in the application here or in our shop and we will make you an offer immediately. • Response within few minutes. • Down payment starting from 0 Euros. • The interest rate is one of the lowest in Estonia and is calculated only from the hire purchase balance. You can choose the appropriate monthly payment and payback period yourself. The shown example uses rounded monthly payments with an interest rate of 15,9%. The exact monthly payment is agreed upon in the contract. • The decision on granting instalment payments is valid for 60 days. During the given period you can purchase goods and services to the extent of the credit limitt. • The minimum monthly income of the applicant must be 250 Euros. • The contract fee is from 19,90 Euros. • The contract period is up to 48 months. Companies that have been operating for at least one year, can also use LHV hire purchase. To do so, submit an application, annual report of the company for the past year, balance and income statement as at the last month. 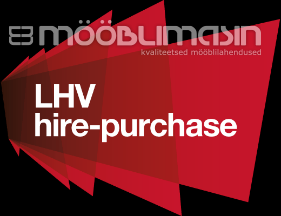 Send the documents to the address jarelmaks@lhv.ee and you will receive an offer within three days at the latest. We may request for a surety from the owner of the company, from a member of the board or another company. The annual percentage rate of a hire-purchase is 25.64% per annum on the following example conditions: cost of goods/services € 650, down-payment 0%, credit amount € 650, interest rate 19,9% of the balance per annum (fixed), contract fee € 19.9 and the period of payment is 25 months. The sum shall be paid in monthly annuities and the total sum of payments is € 820.